Home / Articles & Videos / Is Deflation Bad For Gold Prices? 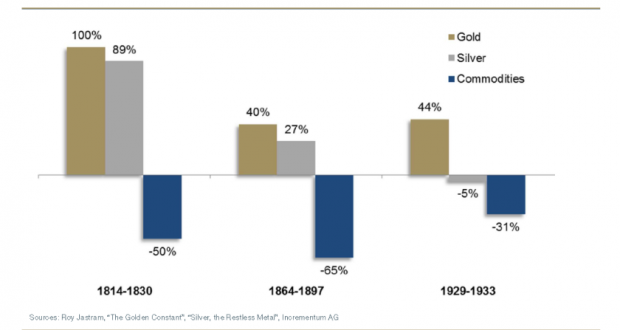 Is Deflation Bad For Gold Prices? Since the start of this gold correction, the bearish arguments I hear are that there is no risk of hyperinflation or even inflation, but rather a risk of deflation (or a negative inflation rate, not to be confused with a lower rate of inflation increase, or disinflation). What to make of it? First, let us define what we mean by inflation. In general,inflation is defined as an increase in the price of most goods and services. But what causes this increase? The price increase occurs, as an after-effect, because of an increase in the amount of money in circulation. And this happens when a central bank issues more money than is necessary for the transactions of goods and services. Instead, what happens in that case is rather a loss of value of the currency (dollar, euro etc.) due to its increased supply, rather than a change in the supply and demand of said goods and services. In a period of deflation, the value of money increases and interest rates become negative, so people wish to keep some cash out of the banking system. This is catastrophic for the banking system and may even lead to its destruction. This is why deflation is the greatest ennemy of the bank of banks, the country’s central bank. The most widely known, the United States Federal Bank, or the Fed, through its Chairman Ben Bernanke, has even proclaimed deflation to be ennemy number one for several years. But after a prolonged period of indebtment comes a period of dis-indebtment that may lead to a period of deflation. How did gold react in the prior periods of deflation? Roy Jastram, author of an excellent book on gold, The Gold Constant (1), has identified three major periods of deflation : 1814-1830 (16 years), 1864-1897 (33 years) and 1929-1933 (4 years). The only monetary parameter that stayed constant throughout those periods has been gold. A given quantity of gold would be traded for 80% more commodities in 1896 in the United Kingdom than twenty years sooner. Between 1920 and 1933, prices fell to their lowest level in British history. Gold reacted by increasing in price at the same time as the commodities until it peaked in 1920. The gold price index has stayed constant, within one decimal, for 90 years. Then, between 1918 and 1920, it jumped by 33%. Previous: What If There’s A Recession in 2014?